Extech of Goleta, Calif., is recalling about 1,720 digital clamp meters sold in the U.S. and Canada. The company has received two reports of clamp meters displaying an incorrect voltage reading. No injuries have been reported. 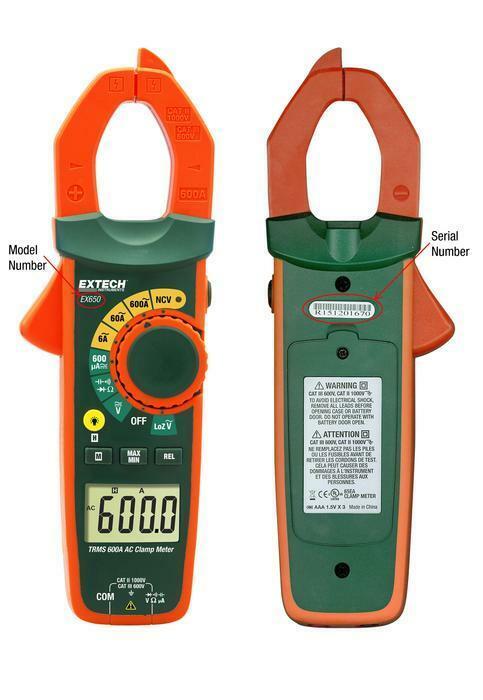 This recall involves Extech digital clamp meters with model numbers EX650, EX655, MA160, MA61, and MA63 in the colors of green and orange. These models are all AC/DC clamp meters, which are electrical testing devices that measure AC/DC voltage, resistance, capacitance, frequency, temperature, continuity, and diode. Serial numbers in the following format are included in the recall: R15XXXXXXX to R17XXXXXXX. Only serial numbers in this range are included in the recall. The “EXTECH” logo and the model number are printed on the front of the unit and the serial number on the back. The clamp meters, manufactured in China, were sold at Grainger, Platt Electric Supply stores and industrial and electrical distributors and wholesalers nationwide and online at Amazon.com and other websites from January 2016, through April 2017, for between $110 and $230. Consumers may contact Extech toll-free at 855-239-8324 from 9 a.m. to 5 p.m. (ET) Monday through Friday, by email at meter.recall@extech.com, or online at www.extech.com and click on Safety Notices at the bottom of the page for more information.